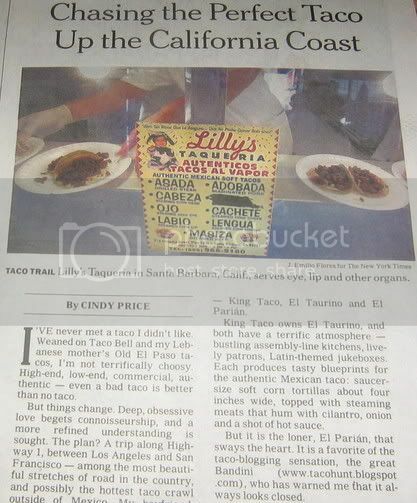 NY Times writer Cindy Price has written an excellent article on the taco trail from Los Angeles to San Francisco. The NY times crew hit highway 1 and sampled tacos up and down the coast. An impressive taco run and one that will go down in the annals of taco exploration. El Parian, King Taco, El Taurino and Tacos Baja Ensenada make the cut in Los Angeles. Yours truly is mentioned and described as a taco-blogging sensation! Yes! Fish tacos, carne asada , al pastor, lengua, even tacos de ojo! (cow eyes) are sampled. Ms Price and crew hit up 28 taquerias and 49 tacos in 5 days! Quite the taco conquistadors! Congrats on the mention in the NY Times! Perhaps one day my burrito blog will be as loved as your taco blog. I don't know if I can do it, but I must try. UPSIDE (for Bandini): Walk in with a copy of the article from "The Paper of Record" and it's free tacos wherever you go. DOWNSIDE (for the rest of us that rely on Bandini's honesty): Instead of a tortilla, some proprietors of some establishments will be wrapping carnitas in $100 bills. I expect an sudden surge of El Parian-esque 5-taco ratings for some sub-Parian tacos. BEST CASE SCENARIO: The NYT article gets the attention of Mayor Villaraigosa and the L.A. City Council, thus saving our taco trucks. Also, taco vendors start to recognize it's their civic duty to provide the best possible tacos to Los Angeles's denizens. And finally, Bandini gets a much better paying gig as Food Critic for a Major Metropolitan Newspaper. no titos in culver city on washington place, if you didn't you you missed out muchacho. Bandini...congrats bro! Man, taco trucks makes me LOOOOOOOVE LA. It's what we should be known for...ya know! 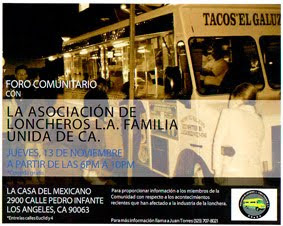 Did they mention La Superrica in Santa Barbara? Personally, I think they the hype regarding the place is well justified. If you ever hit the road, I'd like your impression of La Superrica. Bandini, I read the NY Times article and followed the link to your blog. I love your blog and read it every week even though I live in ... Boulder Colorado. Most of the times I love it here but your descriptions of the tacos in LA make me long to visit. Thanks for your blog. Bandini, I read the NY Times article and followed the link to your blog. I love your blog and read it every week even though I live in ... Boulder Colorado! Most of the times I love it here but your descriptions of the tacos in LA make me long to visit. Thanks for your blog. YOU GUYS HAVE TO TRY THE TACOS FROM WWW.WANTACOS.COM. ALL SERVED AT YOUR OWN HOUSE. TRY THEM FOR YOUR PRIVATE PARTIES. ALL MEETS FRESH AND GREAT SALSAS. i wasjust in Hanalei Kauai and there is a bar "Tahiti nui". with the most insane tacos. made by this lady from Acapulco. excellent!!! i think is called taco tuesday. wild boar! asada, ahi fish. but the salsa was a big hit. the best i have ever tryied. and i've been everywhere looking for the best. Greetings from the Tamale Trail! The Taco Review - the tastiest carne asada from trucks, stands and restaurants!